Create your anonymous identity (eg; Flower Lover) for this workshop. To protect your privacy, we do not share your real name with your team, we will display a screen name instead. Enter a unique password that you will remember. A workbook will be mailed to the address you provide. Program reminders and updates will be sent by email. Enroll in one of our upcoming 6-week workshops! Better Choices, Better Health is a program offered at no cost to you. Our workshops offer new activities each week. When would you prefer to enroll? Select one In 1 month. In 3 months. In 6 months. Stanford University 2007-2019. All rights reserved. Republication or redistribution of Stanford University content is expressly prohibited without the prior written consent of Stanford University. 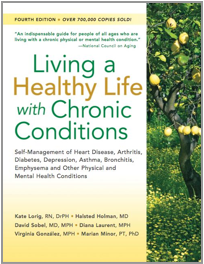 Chronic Disease Self Management Program (© 2007-2012 The Board of Trustees of the Leland Stanford Junior University), a self-management course developed at Stanford University for individuals 18 years or older living with long-term conditions. This Web Site and its content may not be copied, reproduced, republished, uploaded, posted, transmitted, distributed, or used for the creation of derivative works without CANARY HEALTH's prior written consent, except that CANARY HEALTH grants you non-exclusive, nontransferable, limited permission to access and display the Web pages within this site, solely on your computer and for your personal, non-commercial use of this Web Site. This permission is conditioned on your not modifying the content displayed on this site, your keeping intact all copyright, trademark, and other proprietary notices, and your acceptance of any terms, conditions, and notices accompanying the content or otherwise set forth in this site. Notwithstanding the foregoing, any software and other materials that are made available for downloading, access, or other use from this site with their own license terms, conditions, and notices will be governed by such terms, conditions, and notices. engage in activities, whether lawful or unlawful, that CANARY HEALTH determines in its sole discretion to be harmful to other users of the Web Site, Web Site operations, Service, or CANARY HEALTH's reputation, goodwill or customer relations or which may expose CANARY HEALTH, its licensees or its licensors or users to any harm or liability of any type. Your failure to comply with the terms, conditions, and notices on this Web Site may result in immediate termination of any rights granted to you, without prior notice. You must immediately destroy all copies of downloaded materials in your possession or control. Except for the limited permission in the preceding paragraph, CANARY HEALTH does not grant you any express or implied rights or licenses under any patents, trademarks, copyrights, or other proprietary or intellectual property rights. You may not mirror any of the content from this site on another web site or in any other media. If CANARY HEALTH or its Licensees become aware of harmful or potentially harmful activities or inaccurate or misleading information or Content, in their discretion, CANARY HEALTH or its Licensees may take steps to stop such activity or remove such inaccurate or misleading information, such as removing any offending materials or postings; using screening software to block offending materials or activity; denying the offender access to the Web Site, or any other action CANARY HEALTH or its Licensees deem appropriate, in their discretion. "Content" shall mean any and all content and information available through the Service, including without limitation any benefit program description and information, government resources, facilitator, moderator and user posts, information, comments and commentary and other information and materials in the form of images, photographs, animations, video, audio, text and applets incorporated into the Service and made available on the Web Site. CANARY HEALTH does not monitor the Web Site on a continuous basis. CANARY HEALTH cannot assure that any submission by you to the Web Site, including but not limited to questions, comments, or suggestions shall be acknowledged by CANARY HEALTH or receive a response. If you make any submission on the Web Site, or if you submit any business information, idea, concept or invention on the Web Site or to CANARY HEALTH by email, you automatically grant or warrant that the owner of such content or intellectual property has expressly granted CANARY HEALTH a royalty-free, perpetual, irrevocable, world-wide nonexclusive license to use, reproduce, create derivative works from, modify, publish, edit, translate, distribute, perform, and display the communication or content in any media or medium, or any form, format, or forum now known or hereafter developed. CANARY HEALTH may sublicense its rights through multiple tiers of sublicenses. If you wish to keep any business information, ideas, concepts or inventions private or proprietary, do not submit them on the Web Site or to CANARY HEALTH by email. ANY LINKS ON THE WEB SITE (INCLUDING THOSE POSTED BY USERS OF THE WEB SITE) THAT ALLOW YOU TO ACCESS A THIRD PARTY SITE ARE NOT UNDER THE CONTROL OF CANARY HEALTH AND ACCORDINGLY CANARY HEALTH IS NOT RESPONSIBLE FOR THE CONTENTS OF ANY THIRD-PARTY LINKED SITE, ANY LINK CONTAINED IN SUCH LINKED SITE, OR ANY CHANGES OR UPDATES TO SUCH SITES. CANARY HEALTH IS NOT RESPONSIBLE FOR WEBCASTING OR ANY OTHER FORM OF TRANSMISSION RECEIVED FROM ANY SUCH LINKED SITE. THESE LINKS ARE AVAILABLE TO YOU ONLY AS A CONVENIENCE, AND THE INCLUSION OF ANY LINK TO A THIRD-PARTY SITE DOES NOT IMPLY ENDORSEMENT BY CANARY HEALTH OF THE SITE. Stanford Junior University), is and shall remain vested in Stanford University (and CANARY HEALTH as licensee). All title and intellectual property rights in and to the Content which may be accessed through use of the Service is the property of the respective Content owner and may be protected by applicable copyright or other intellectual property laws and treaties. No ownership of any part of the Service or Content is transferred to you in any manner whatsoever. Use of the Web Site, Service or Content does not grant to you any rights in connection with any trademarks or service marks of CANARY HEALTH or its licensors. Without CANARY HEALTH's prior written consent, you agree not to display or use any trademarks or service marks of CANARY HEALTH or its licensors, including Stanford University, in any manner. or its licensees may also in their discretion limit access to the Web Site and/or terminate the access of any users who infringe any intellectual property rights of others, whether or not there is any repeat infringement. Any information that is voluntarily submitted via this Web Site will be maintained or accessed in servers located in the United States. By using the Service and accessing the Web Site, you consent to your data being sent to a server located in the United States. The Service contains Content related to health, self-care or medicine, which is made available for informational purposes only to assist users in their individual self-care decision-making. No Content is intended to be a substitute for professional advice, diagnosis, or treatment or individualized decision-making. CANARY HEALTH, its licensees and its licensors do not recommend or endorse any specific care facilities, physicians, tests, products, procedures, opinions, or other information that may be mentioned on the Web Site. Always seek the advice of your physician or other qualified health provider with any questions you may have regarding a medical condition. Never disregard any professional medical advice or delay in seeking it because of something you have read on the Web Site. Neither CANARY HEALTH nor any facilitators, mentors or other Web Site moderators assume any duty to identify or report any serious health conditions or imminent threats to your mental or physical health or well being or that of anyone else. Users are welcome to share information and resources in public forums contained on the Web Site. However, reliance on any information provided or shared by other users of the Web Site is strictly at your own risk. The Web Site contains Content of third parties and is not promised or guaranteed to be correct, current, or complete, and may contain inaccuracies or errors. CANARY HEALTH and its licensees and their respective representatives (including facilitators and mentors) assume no responsibility (and expressly disclaim responsibility) for updating the Web Site to keep information current or to ensure the accuracy or completeness of any posted information. CANARY HEALTH provides no assurances that any reported problems with the Web Site will be resolved by CANARY HEALTH, even if CANARY HEALTH elects to provide information with the goal of addressing a problem. HARMFUL COMPONENTS. YOU ASSUME THE RESPONSIBILITY FOR THE SELECTION OF THE SERVICE TO ACHIEVE YOUR INTENDED RESULTS AND FOR THE USE OF AND RESULTS OBTAINED FROM THE SERVICE. PRODUCTS OR SERVICES OFFERED THROUGH THE SERVICE AND WILL NOT BE A PARTY TO OR IN ANY WAY MONITOR ANY TRANSACTION BETWEEN USERS AND THIRD PARTY PROVIDERS OF PRODUCTS OR SERVICES. USE OF THE WEB SITE AND THE SERVICE IS AT YOUR OWN RISK. All Content is provided for informational purposes only. CANARY HEALTH and its licensees disclaim any and all responsibility for the Content, the accuracy of such Content and for any decisions that you may make based on such content. THE FORM OF THE ACTION, WILL AT ALL TIMES BE LIMITED TO THE AMOUNT PAID, IF ANY, BY YOU FOR THE SERVICE, BUT IN NO CASE WILL CANARY HEALTH's OR ANY OF ITS LICENSEES’ LIABILITY TO YOU EXCEED $1,000. THAT YOU WILL BE SOLELY RESPONSIBLE FOR ANY DAMAGES THAT MAY RESULT, INCLUDING LOSS OF DATA OR DAMAGE TO YOUR COMPUTER SYSTEM. The Service and Web Site are "commercial items" as that term is defined in 48 C.F.R. Welcome to the Better Choices, Better Health® Online Web Site (the "Web Site") operated by ABK Ventures Inc. d/b/a Canary Health ("CANARY HEALTH", “we” or “us'”). The Web Site contains the Better Choices, Better Health online self-management program, originally developed as the Chronic Disease Self-Management Program (© 2007-2012 The Board of Trustees of the Leland Stanford Junior University), a self-management course developed at Stanford University for individuals 18 years or older living with long-term conditions. Protecting the privacy of the user’s information collected by the Web Site is critically important to CANARY HEALTH. We value and respect your trust and believe you have a right to know about how we collect and secure information we collect about you. We use commercially reasonable privacy and security protections to help keep your Personal Data private and confidential while using the Web Site. The Web Site may collect Personal Data from you through several means, including from information you provide in registering with the Web Site to participate in our sponsored programs and workshops, participating in a survey about your health, mood and activities, contributing to discussion boards with your facilitators, moderators and peer participants, as well as planning and tracking tools, and an electronic post office. While CANARY HEALTH encourages participants to share personal experiences and opinions, it is entirely voluntary and you are not obligated to disclose details about your chronic condition. You are also allowed and encouraged to use an alias or “screen name” (fictitious name) to identify yourself on the Web Site, further protecting your privacy from your peer participants. Only those individuals responsible for managing, overseeing and administering the Web Site, and those to whom you have given consent will be able to view your actual name and contact information. CANARY HEALTH will maintain the privacy and confidentiality of your Personal Data as provided by applicable law. Personal Data will be maintained on CANARY HEALTH servers for the Program Period. CANARY HEALTH may combine, in a non-identifiable format, the Personal Data you provide with information from other users to create aggregate data that may be disclosed to third parties and used by CANARY HEALTH for any lawful purpose. This aggregate data does not contain any personal identifiers that could be used to contact or identify you, such as name, address, or telephone number. This aggregate data may be maintained by CANARY HEALTH for the period of time deemed appropriate by CANARY HEALTH. For persons participating through the Oregon Educators Benefit Board, Personal Data, which includes your name, birthdate, E-number, class cost, and whether or not you attended and/or completed a workshop will be shared with the Oregon Educators Benefit Board in an identifiable format, and will be transmitted over a secured electronic system. The Personal Data listed above is provided to verify workshop eligibility, enrollment and completion and for payment purposes. For persons participating through the Public Employees’ Benefit Board (PEBB), limited Personal Data, which includes your name, birthdate, whether or not you completed a workshop will be shared with PEBB in an identifiable format, and will be transmitted over a secured electronic system. The Personal Data listed above is provided to verify workshop eligibility, enrollment and completion. For persons participating through Government Employees Health Association (GEHA) or one of its subsidiaries, Personal Data, which includes your name, ethnicity, race, birthdate, gender, health conditions, zip code and whether or not you attended and/or completed a workshop will be shared with GEHA in an identifiable format, and will be transmitted over a secured electronic system. The Personal Data listed above is provided to verify workshop eligibility, enrollment and completion, coordinate services, and for reporting purposes. For persons participating in wellness programs who request confirmation that they have satisfied a wellness program activity, GEHA will share information with the sponsor of the wellness program, which may be the person’s employer or employer’s health benefits coordinator. Information provided will include health plan enrollment status, status of workshop completion, and workshop enrollment and completion dates. Information that will not be shared includes postings in the discussion center, goals and action plans, individual internet tools in the workshop and any other electronic communication within the workshop platform. For individuals enrolled in the Better Choices Better Health Program (BCBH) via SmartHealth, your participation is funded by a grant to the Washington State Department of Social and Health Services (DSHS) from the Administration for Community Living (ACL), which is a division of the U.S. Department of Health and Human Services. To verify participation and perform program evaluation, Personal Data will be shared with ACL or its contractors, DSHS, and the Washington State Health Care Authority’s Public Employees Benefits (PEB) Program via a secured electronic system. The Personal Data shared may include your BCBH participant identification, your responses to the voluntary participant information survey, workshop participation, and discussion board participation. For persons participating through Kaiser Permanente Southern California, Personal Data, which includes your name, birthdate, registration code, and whether or not you attended and/or completed a workshop will be shared with Kaiser Permanente Southern California in an identifiable format, and will be transmitted over a secured electronic system. The Personal Data listed above is provided to verify workshop eligibility, enrollment and completion. For persons enrolled through New Mexico Health Connection ("NMHC"), personal data, which includes your name, ethnicity, race, birthdate, gender, health conditions, zip code and whether or not you attended and/or completed a workshop will be shared with NMHC in an identifiable format, and will be transmitted over a secured electronic system. The personal data listed above will be used to verify workshop enrollment, attendance, and completion. This information will be used by NMHC to analyze and assess information-seeking outcomes. Information that will not be shared includes postings in the discussion center, goals and action plans, individual internet tools in the workshop and any other electronic communication within the workshop platform. For individuals enrolled in the Better Choices Better Health Program (BCBH) via the New Mexico Retiree Health Care Authority landing page, http://enroll-nmrhca.selfmanage.org, your participation is funded by a grant to the New Mexico Department Of Health (NMDOH) from the Administration for Community Living (ACL), which is a division of the U.S. Department of Health and Human Services. To verify participation and perform program evaluation, Personal Data will be shared with ACL or its contractors. The Personal Data shared may include your BCBH participant identification, your responses to the voluntary participant information survey, workshop participation, and discussion board participation. Personal Data you share on this Web Site may be disclosed to workshop facilitators, mentors and other moderators in connection with the workshop in which you participate. However, note that CANARY HEALTH and its workshop facilitators, mentors and other moderators assume no duty to identify or report any potential threats of imminent harm to your health or wellbeing or that of third parties based on information you or other users share on this Web Site. CANARY HEALTH ("Third Party Web Sites"). CANARY HEALTH does not disclose your Personal Data to these Third Party Web Sites without obtaining your consent. CANARY HEALTH does not endorse and is not responsible for the privacy practices of these sites. The Web Site features several community areas and other public forums where users with similar interests or medical conditions can share information and support one another or where users can post questions for comments. We also offer online discussions moderated by facilitators. Our communities are open to all workshop participants and should not be considered private. Any information you share in any online community area or online discussion is by design open to workshop participants and is not private. You should think carefully before posting any Personal Data in any public forum. Our Web Site and database servers are hosted in a secured physical and network environment in the United States. Reasonable efforts are made to secure web servers, networks, host operating systems and databases against unauthorized access. We use a variety of security measures to protect Personal Data when stored or transmitted by CANARY HEALTH, including Secure Socket Layer (SSL) Encryption. In order to take advantage of encryption, you must have an Internet browser that supports 128-bit Encryption . Despite CANARY HEALTH's efforts to protect your Personal Data, there is always some risk that an unauthorized third party may find a way around our security systems or that transmissions of your information over the Internet will be intercepted. Please remember that no security measures are foolproof; and CANARY HEALTH cannot guarantee that information will be protected in all situations. We will make reasonable efforts to protect your Personal Data from unauthorized access. This Web Site is not designed to attract or be used by children under the age of 13. We do not knowingly collect Personal Data from anyone under the age of 13 unless we first obtain permission from that child’s parent or legal guardian. ”Encryption” means the translation of data into a secret code. Encryption is the most effective way to achieve data security. To read an encrypted file, you must have access to a secret key or password that enables you to decrypt it. “Firewall” means a system designed to prevent unauthorized access to or from a public or private network. Firewalls can be implemented in both hardware and software, or a combination of both. Firewalls are frequently used to prevent unauthorized Internet users from accessing private portions of public networks. All messages entering or leaving the network pass through the Firewall, which examines each message and blocks those that do not meet the specified security criteria. “Personal Data” means information that is identifiable to a particular individual. Examples of Personal Data include your name, home address, telephone number, and email address. If other pieces of information are linked to Personal Data, they may also become Personal Data. “Program Period” means at least 15 months after the conclusion of any workshop in which you participate utilizing the Web Site. “Secure Sockets Layer” (SSL) means a security protocol for transmitting private information via the Internet. SSL works by using a private key to encrypt data that's transferred over the SSL connection. URLs that utilize an SSL connection start with https: instead of http. “Cookie” means a data file that is stored on the hard drive of the computer you use to view a web site. Cookies are placed by that site or by a third party with a presence on the site and are accessible only by the party or site that placed the Cookie (i.e. a Cookie placed on your computer by CANARY HEALTH isn't accessed by any other site you visit but a Cookie placed on your computer by an advertiser may be accessed by any site on which that same advertiser has a presence). Cookies can contain pieces of Personal Data. Cookies are used to make the site easier to use. For example, if you check a box to ask that we store your user name on your computer so that you don't have to enter it each time you visit the site, it's stored in a Cookie on your computer.